The South Central Regional Training Partnership Pioneer Forum gathered pioneers and pioneer enablers from across the region to engage in a constructive conversation around pioneer ministry in new housing developments. The conversation was facilitated by Paul Bradbury (SCRTP Pioneer Hub Co-Ordinator) & Jon and Tammy Oliver, pioneer ministers from Southampton. We had three presentations to help develop our conversation; Ali Boulton, (Baptist pioneer on The Stowe, Swindon, Pioneer enabler for the Southern Counties Baptist Association and Co-Founder of the National New Housing Hub), Hasna Khatun, (pioneer curate in Centenary Quay, Southampton) and Martin Gorick (Archdeacon of Oxford and Chair of the New Communities Group in Oxford Diocese). 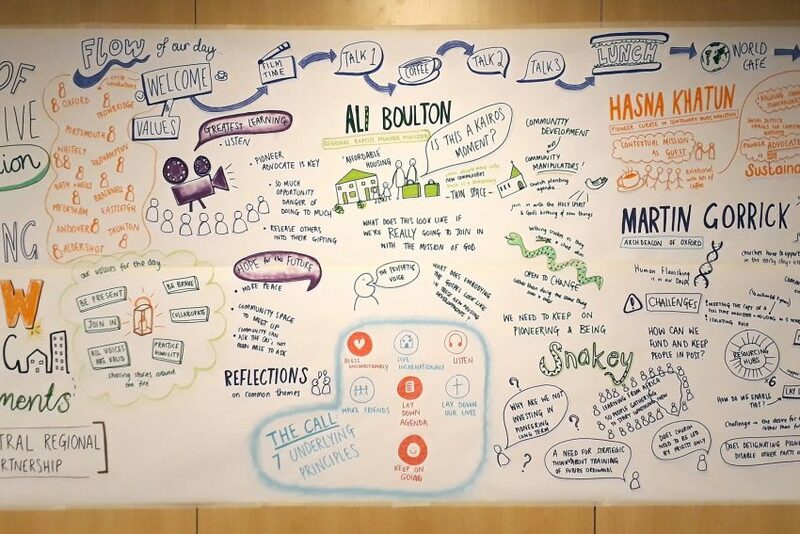 A film drawing on the experiences of new housing pioneers from across the region was shown at the beginning of the day. We wanted to ask whether pioneer ministry on new housing developments asks for particular ways of being and doing. Ali Boulton argued that part of the uniqueness of this ministry is due to the particular opportunity provided by such a huge and rapid nationwide programme of housing development. Ali asked us: ‘Is this a kairos moment?’ as large numbers of people arrive in new communities that, for a time, are a ‘thin place’ in which the ministry the church can be particularly fruitful. In new housing contexts ‘everyone if is the same boat’ and there is an openness to the leadership needed to form place and form community. In this respect whilst community development can form a significant part of the pioneer’s ministry in most contexts, there is a particular emphasis on this dimension for ministry in new housing contexts where a desire for connection and place-making, combined with limited resources from the statutory sector, means that the church is a welcome partner in the leadership required to enable both. So what might the identity and role of the pioneer be. Are they a community development worker? Church planter? ‘Cure of souls’ to this new community? Community evangelist? Or all of these? And if so how can these different roles be navigated together? Unsurprisingly what then emerged from our conversation was not a title that best described the identity and role of the pioneer. The issues of sustaining ministry in new contexts is also not unique to areas of new housing. However, this is an area of ministry that has been a focus for investment of money from sources such as the Strategic Development Fund. Martin Gorick cited the a cost of £0.5m over 7 years for a full-time pioneer post and argued that therefore ‘lay leaders are key’. This brings into focus the question of what we mean by sustainability – ‘its not all about money! – or even if we want to use the word sustainability at all when this word seems wedded to ‘a model of investment and return’. Furthermore, the question of sustainability cannot be fully answered at the local level: ‘if you want to ask genuine questions about sustainability you have to ask them at the highest possible levels of your church.’ The question of sustainability is being asked in the context of felt injustices in the balance between the funding of established and new ministry. The institution is also an important provider of other means of sustainability. Hasna Khatun argued for the critical importance of a pioneer advocate in supporting and sustaining her ministry. Resourcing hubs and the support and accountability of steering groups or trustee boards are also key. In this sense the sustainability being argued for is one of constant missional imagination and adaptability – not the kind of sustainability often assumed by the word, where a community develops into something established and maintained. Ali Boulton argued that instead of seeing this ministry as creating butterflies, i.e. 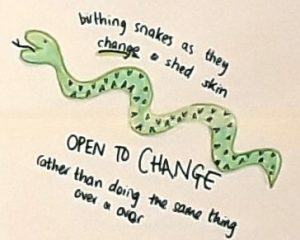 a new form of church emerging from an initial pioneering phase, we should be creating communities more like snakes – able to grow and shed their skin in order to constantly adapt and change. The ‘mission of God is always renewed afresh’ as the Holy Spirit is at work in a society that is now one of constant and accelerating change. We might all need to ‘be more snakey’ (!) and see sustainability as something far more fluid than solid. 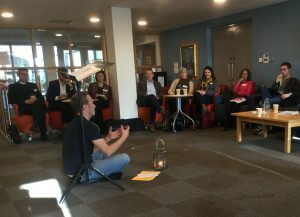 The Pioneer Forum was organised by the South Regional RTP Pioneer Hub which is supported by the Dioceses of Bath & Wells, Guildford, Oxford, Portsmouth, Salisbury and Winchester, the Southampton Methodist District and the URC Wessex Synod. The Hub is hosted by Church Mission Society. A full report of the forum can be found here. Thanks for this great summary, Paul.